The long and the short of it! Thanks to Gavin Hoffman, we can now show you exactly what we meant a couple of days ago (in our now answered plea for all Drammy Award forms), by The Tall Crystal with Stars and the Shorter Crystal with Stars (and by the way, you are ALL stars! ), as Gavin kindly sent a picture of his awards in situ, from 2011 and 2012 (obviously the year they changed. I don’t know why we went from tall to short…yet another fascinating line of inquiry to be undertaken in our relentless research over at Drammy Towers). 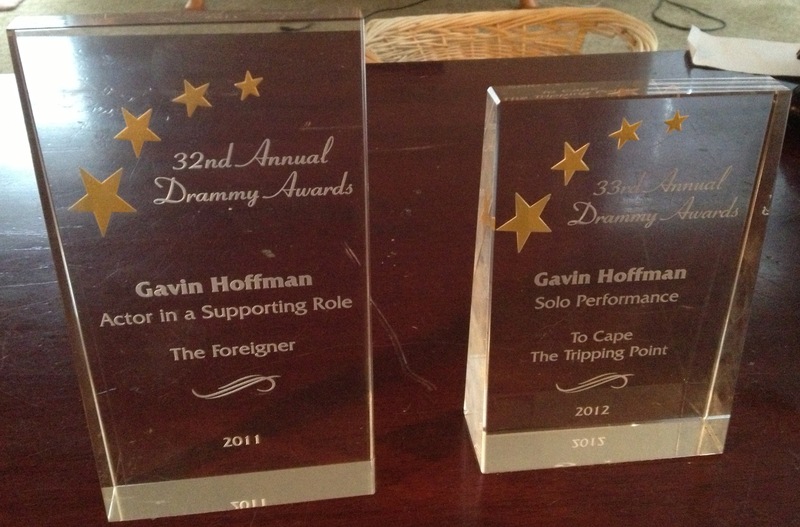 As you see, Gavin’s awards were for his outstanding work as Actor in a Supporting Role in The Foreigner, and Solo Performer in To Cape: The Tripping Point. Speaking of research, we have been informed of gaps in the lists of awards for previous years. Thank you; this is EXACTLY what we want to know. Please, please, PLEASE tell us if your awards aren’t listed. It may come as a HUGE surprise to you to learn that “Drammy Towers” is merely a sort of dreamlike castle-in-Spain/Hogwarts type of edifice, so really there’s no central place where archives have been kept (alas and alack). So this here blog thing on this our new website, along with our Facebook page and Twitter feed, is at least in part our attempt to reach out and reconstitute our records. One of our previous Committee Members (to whit, the wondrous Cameron McFee) did a superlative job of scanning old programs and newspaper cuttings and goodness knows what-all to get the information we now have, which he uploaded laboriously onto the OLD website shortly before we moved over here. We have now transferred (not quite as laboriously, of course, but laboriously enough, I promise) most of that information to what we hope is a more user-friendly position on this NEW website. But there are vast lacunae that we need YOUR help to fill. So please…if you have a Drammy from anytime over the past 34 (and more of THAT anon!) years or so, check out the page that shows past awards and make sure YOURS IS THERE. If it isn’t PLEASE contact us so we can add you. You can email me (Cate Garrison) directly if you have my email address, or use pdxdrammys@gmail.com, or comment here, or message us on Facebook. And while you are doing that, PLEASE sign up to our subscriber email list here (it is free, of course). We promise we won’t inundate your inboxes. But we also promise you will be the first to know whenever there’s something new or interesting to report. Thank you! See you at the theatre. Next34 years and counting. And counting? Drammys on the horns of a dilemma!